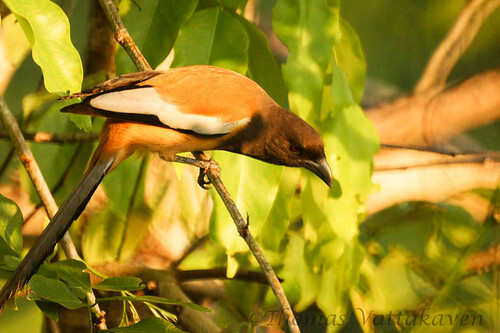 The Rufous Tree-pie (Dendrocitta vagabunda) is among the noisiest of the birds found in Karimannoor. 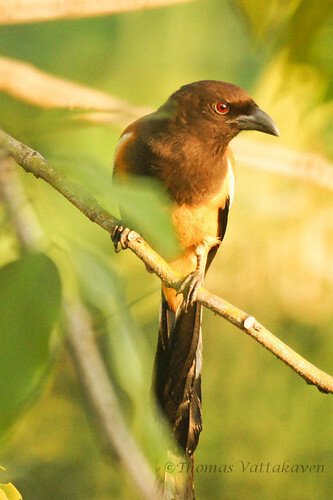 It is a member of the crow family, and has a wide distribution across India. It is an arboreal species, feeding mostly among the tree tops where it is very agile. 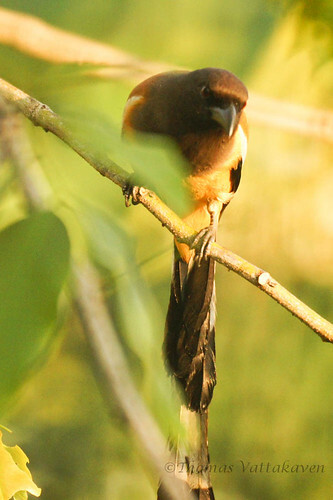 It is commonly found in mixed hunting parties with Drongos, Orioles and Babblers. They are omnivorous and will feed on a wide variety of food ranging from fruit and seeds to insects, reptiles and even young birds. 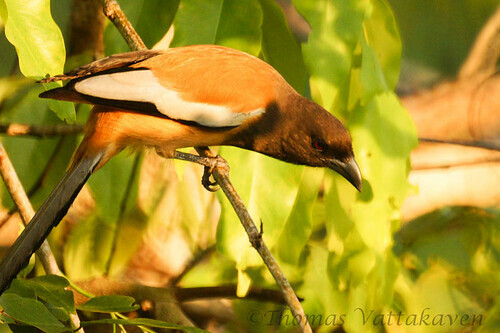 In Kerala, these birds are called the “Olanjaali” refering to its common occurrence on coconut trees. They are beneficial to the trees as they feed on the grubs of the destructive weevil Rhynchophorus ferrugineus. Great Shots! I've come across this bird many times in India. Yes, it sure is noisy! Many Thanks for visiting my blog. we sleep on our terrace in chennai ( india ). i have been often woke up at about 7am by a noisy bird sitting on the neem tree. since i could only see its front i thought it was a cuckoo shrike ( it even sounded like one ) today i put on my glasses and followed its call and saw it from behind and it was definitely a rufus tree pie ! the Salim Ali bird book shows a black bird with no white or grey so i was confused, but am delighted to have found so many pictures of the rufus tree pie on the net.